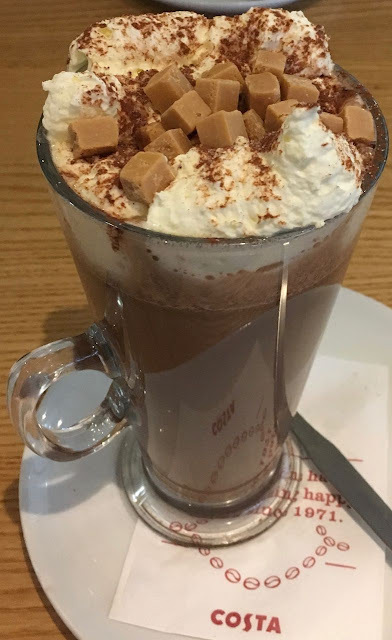 Anyway, the Costa Toffee Apple Hot Chocolate arrived and was enough to put a smile back on my face, it was cream topped, dusted with cocoa and further topped with pieces of fudge, heaven. I started by eating the fudge and cream and enjoyed its vanilla and toffee flavour. No apple yet, but I had the main part of the drink to go. I gave it a stir as I hate when the syrup settles at the bottom, and gave it a sip. The drink was very rich and soothing, mainly the heavy taste of dark treacle toffee dominated the flavour. This was truly a cold weather drink, and the tones of toffee were strong, but the apple element was very mild. It is far more toffee than apple, and missed its opportunity to have the acidic apple taste cut through the rich toffee, the way that the berry flavour in the Black Forest Gateau Hot Chocolate balanced the drink. This is a nice treat of a drink until the Black Forest Gateau Hot Chocolate is back, but it's no replacement for it. I loved this drink! For some reason mine came with crunchy toffee pieces instead of fudge, and tasted a lot more of apple than you described. I'd try it again - but the Black Forest one is still the best! YEs - other people have mentioned the topping - I'll have to order another one to check it out!